Important recent developments in growth research have been based on the enhanced awareness of the high levels of productivity dispersion that exist in developing countries, both across firms within industries as well as within firms. While there have been attempts to understand intra-firm levels and variations in productivity in formal sector firms, it is less common for researchers to rigorously explore productivity differentials within semi-formal social businesses that are also more domestic demand oriented. This study explores the possibility of applying a similar rigorous protocol to measure and explain the levels and variation in productivity in a semi-formal production arrangement. 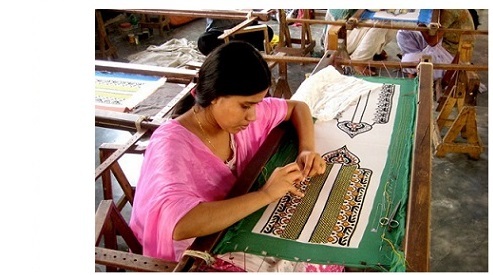 The researchers will partner with Ayesha Abed Foundation (AAF), a social enterprise of BRAC, which employs about thirty thousand artisans through about 500 small factory-like sub-centres in Bangladesh. The data will come from two sources. First, the researchers will use administrative records to measure artisan productivity, working with designers to understand style specific standard minute values. They will also identify tasks that are similar to products commonly produced at Ready Made Garment (RMG) factories in Bangladesh in order to compare the productivity of the AAF to the average workers’ or lines’ productivity to the RMG sector. Second, they will conduct a survey of artisans to understand the capital investment and working environment that contribute to their productivity, combining this with additional information (for example, sub-centre specific weather shocks such as temperature) to explain the variation in individual, line or sub-centre level variation in productivity. In Bangladesh, as elsewhere in developing countries, the not-for-profit sector provides employment to a large proportion of workers, and therefore it is essential to document and understand labour productivity characteristics in this sector.